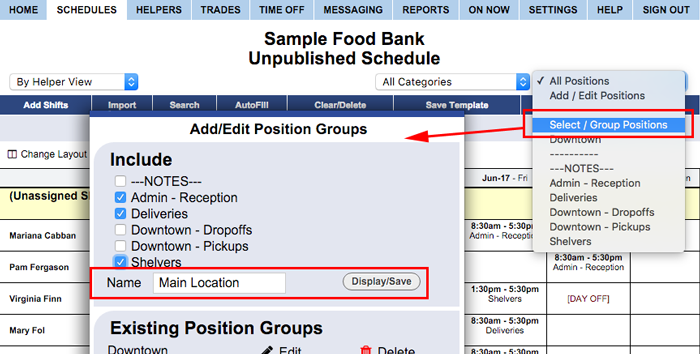 If you have created Location-Specific Positions, you can group each location's positions for quick viewing. This adds Group names to the top of the Positions dropdown menu and allows you to filter your view to display only those positions in each group. Each Position can be included in any number of Position Groups. You can create any number of Position Groups to show, for example, "cashiers at all locations" or "all positions at one location", etc. The Positions dropdown will now include your new Position Group at the top which can be quickly accessed on all schedules and the Helper list.